Former MP Konstantin Kosachev addresses RBTH’s international guests with a note of optimism. Representatives from Rossiyskaya Gazeta’s 27 international partners descended on Moscow this week for Russia Beyond the Headlines’ 4th Annual Partners’ Conference. As the project has grown from three print supplements among founding partners The Washington Post, The Daily Telegraph and The Economic Times of India to include circulation in places like Australia and Brazil, the number of attendees has multiplied each year. The keynote address at this year’s conference was delivered by Konstantin Kosachev, former parliamentarian and chairman of the State Duma’s Foreign Affairs Committee and current head of Rossotrudnichestvo, the federal agency charged with fostering friendly ties abroad for the promotion of Russia’s political and economic interests. “Before it was enough [for countries] to win the sympathy of foreign governments as partners. In today’s age of information, it’s people’s sympathies that matter. The era of diplomats and summits may be replaced by a dialogue of different cultures and nations,” Kosachev said. 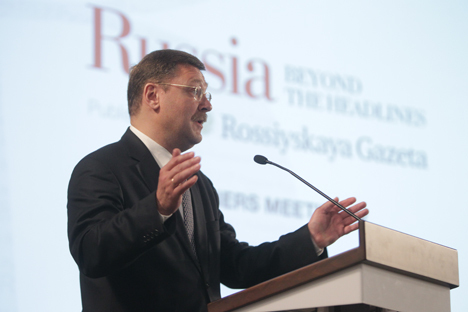 “Russia is experiencing certain difficulties with forming its image right now. Sometimes in countries with a well-developed media environment, the attitude toward us is worse than toward certain dictatorships. We see our goal not as trying to alter reality, but in informing everyone willing to listen. We’re optimistic because reality is on our side,” he said.